The Julii Cory is very pretty, one of the most popular and regularly purchased Corydoras catfish! The Julii Cory Corydoras julii is a beautiful fish with an interesting color pattern. It has creamy white body covered with small black spots and bold central horizontal stripes. There is also a black blotch at the top of its dorsal fin and six spotted bands on its tail. Inspired by its looks it is also called the Leopard Catfish or Leopard Corydoras. The Corydorus are members of the Callichthyidae family of catfish. They have sharp spines in the dorsal, pectoral and adipose fins that contain a mild poison used to ward off fish that may harm them. The overall appearance has an armored look which gives them the common name "Armored Catfish." Although there are over 180 species of Corydoras, only about 50 are available to the hobby and about 10 are bred commercially. The Julii Cory is sometimes confused with a couple of its close relatives that are very similar in appearance. These include the Three Stripe Corydoras Corydoras trilineatus (which is also called the False Julii), the Leopard Cory Corydoras leopardus, and occasionally the Spotfin Corydoras Corydoras punctatus. But with a close inspection they are each readily distinguished. All three have spots and a dark blotch on the dorsal fin. Its the spots on the head of the Julii and Leopard Cories that distinguish them from the Three Stripe, who usually has a reticulated pattern (squiggly lines) on its head rather than spots. The Spotfin Cory is heavily spotted all over but it lacks distinctive horizontal lines as seen on the others. The Julii Cory is a very active catfish but it doesn't get very big. Growing up to only 2.0 inches (5.2 cm) in length makes it very suitable for smaller aquariums. A minimum 10 gallon tank is suggested. Despite being quite active, these are very peaceful fish that enjoy the company of their own kind as well as other fish. To be happy they need to be in groups of at least 4 or more fish. Like all the Cory catfish they are quite hardy, which makes them a great selection first time fish keepers. They also help keep the bottom of the aquarium clean by eating up leftover foods. Their adorable appearance and lively character, along with a sweet disposition make them a favorite among aquarists. A school of these very active little fish will make the bottom of your tank come to life. The Julii Cory Corydoras julii was described by Steindachner in 1906. They are found in South America within the Lower Amazon River and the coastal rivers in northeastern Brazil. They are found in Peru in the Rio Ampiyacu, Rio Ucayali and the Yarina Cocha. Other common names they are known by include Leopard Catfish, Leopard Corydoras, and Peppered cory. In their natural habitat schools of Julii Cories live in flooded forest regions as well as smaller-sized streams and small tributaries. Breeding takes place in swamps, ponds, or streams. They are demersal and feed on worms, crustaceans, insects and plant matter. Social Grouping: Groups - Julii Cories are normally seen in schools. The Julii Cory is a smaller member of the Corydoras family, only growing to about 2 inches. (5.2 cm) in length. They are a beautiful fish with an interestingly patterned body. The body is a cream white or gray color with small, black spots all over and a stripe running horizontally from the back of their gills to the base of the tail. There is a black blotch at the top of its dorsal fin and six spotted bands on the tail. They have a lifespan of 5 or more years. This fish belongs to the catfish family Callichthyidae, and like all catfish they are scaleless. Corydoras are known as armored catfish because they have two rows of bony plates, called scutes, along the length of the body. Like all catfish, they also have pairs of barbels around the mouth and strong, rigid spines on their dorsal and pectoral fins. Cories have also been known to produce sounds of warning when distressed and when courting. They make sounds by rubbing the spines of their pectoral fins into the grooves of their shoulder plates. Size of fish - inches: 2.0 inches (5.08 cm) - Females tend to be larger than males. Lifespan: 5 years - They can live for 5 years or longer with optimal conditions. The Julii Cory is not a difficult fish to care for and makes an excellent addition to any peaceful community aquarium. They are quite durable and great for beginners. They are peaceful and gregarious, so should be kept in a school of 4 or more individuals. Additionally, they will not thrive with aggressive fish. A filtration system is needed that maintains clean water and ensures the entire tank is highly oxygenated. Water movement at the surface is desirable for keeping the oxygen level high. They also require a good supply of food on the bottom of the tank. if the tank is new and not yet established, you can add sinking algae wafers to the tank for food. These fish do a great job keeping the bottom cleaned of food and debris. Also, even though they can withstand a variety of water conditions this fish is not very tolerant of warm temperatures over 85 ° F.
Leopard Corydoras are omnivores that feed on worms, crustaceans, insects, and plant matter in the wild. In the aquarium they are easy to feed. They will generally eat all kinds of live, fresh, and flake foods. To keep a good balance give them a high quality sinking pellet or flake food everyday. Also offer occasional algae wafers. Feed frozen and live food, such as brine shrimp, blood worms, or daphnia as a treat. Tablet / Pellet: Yes - Although this fish will scour the bottom for leftover food, the aquarist should ensure a complete diet by offering a sinking tablet or pellet. Regular water changes with siphoning of the gravel is crucial to remove their waste and keep the tank clean. A weekly or bi-weekly water change of 10% to 20% is recommended. Using a vacuum hose to siphon the substrate is a good way to keep the gravel free of decomposing animal and plant matter. Cory catfish spend most of their time on the bottom so the vacuum siphon is important. Their barbels are prone to infection from a poorly kept substrate. Water Changes: Weekly - Weekly or bi-weekly water change of 10% to 20% are recommended. 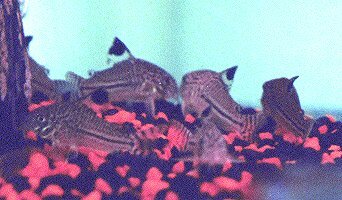 The Julii Cory is an active little fish that does best in a group of 4 or more. A minimum aquarium of 10 gallon is suggested. The aquarium should be decorated, and arranged with their natural habitat in mind. These little fish enjoy well planted tanks with twisted roots to hide in. Caves and drift wood make great hiding spots as well. Provide these fish with filtration system that keeps the water well oxygenated either with aeration or plenty of surface water movement. These fish do a great job keeping the bottom cleaned of food and debris, making them little living vacuums. Normal lighting works well but higher light levels are fine if plenty of shade is provided. Substrate Type: Sand/Gravel Mix - Sand or fine gravel is best to protect their barbels from damage. Water Region: Bottom - They will mostly swim at the bottom of the aquarium. Julii Cories are generally a good community fish. They are not aggressive and are good with other small peaceful fish. They swim in schools and can be kept with almost every other community type fish. Small peaceful community fish such as live bearers, small members of the Tetra family, Danios, Rasboras, and Dwarf Cichlids all make good tank mates. They will not fare well with aggressive fish. They are gregarious and enjoy the company of there own kind. They should to be kept in schools of at least 4-6 individuals. Venomous: No - Corydoras species have spines that can cause a stinging sensation if they penetrate the skin. Same species - conspecifics: Yes - This gregarious fish appreciates the company of its own kind, and should be kept in a group of at least 4 or more individuals. Slow Swimmers & Eaters (): Safe - Corydoras feed at the bottom of the aquarium, so are not in competition with other feeders. Shrimps, Crabs, Snails: May be aggressive - The natural diet of Corydoras are worms, crustaceans, and insects. Males are usually smaller and thinner. The sexually mature female's belly is often rounder than the males so their mouth may sit up off off the substrate when resting. These are only indications and not foolproof. Sexing is difficult, and breeding is best accomplished by natural pairing. The Corydorus have a very interesting breeding routine. When breeding in the aquarium, a ratio of two or more males per female is best. The female will clean a spot on the aquarium glass, or perhaps an object in the aquarium to lay her eggs on. The males initiate courting, which entails chasing the females around the aquarium. The female will swim away, and the males search for her until she is found. The males seem to "shiver" on the female, and may in fact, lie on top of her. When she is ready to spawn, she turns to the male next to her, and adamantly pounds his ventral fin, causing the male to release sperm. The eggs should hatch in 3-4 days after spawning. Do note that these fish will eat their own fry, so they will need to be separated from the parents. The fry should initially be fed protozoan organisms in the aquarium. As they grow, they will be able to accept foods such as baby brine shrimp. See the description of how to breed these fish in Breeding Freshwater Fish: Catfish. Julii Cories are very hardy and disease is not usually a problem in a well maintained aquarium. There is no guarantee that you won't have to deal with health problems or disease, but cory catfish are very resilient. High nitrate levels can cause Julii Cory catfish to develop infected barbels; this makes it difficult for them to navigate and eat normally. Maintain nitrate levels below 20 ppm through regular water changes. Because they are a scaleless fish, catfish can be treated with pimafix or melafix but should not be treated with potassium permanganate or copper based medications. Malachite green or formalin can be used at one half to one fourth the recommended dosage. All medications should be used with caution. The Julii Cory or Leopard Catfish is readily available and ranges from very inexpensive to moderately in price. I recently purchased 4 more julii Cory catfish to my community aquarium. I first purchased 2 & had to have more they add a lot of fun to the gang.I was wondering if anyone knows how long it takes for then to get to be full size adults? They are nocturnal. Thus, they move around more at night or when the light is dim. If you dont like the catfish that stick to a window all day and dont move, then the CORYDORAS species, and especially this one is for you. Its very peaceful, and a good gravel cleaner. Just make sure that the gravel its not rough (no stones or anything) because that can cut and injure their stomachs because they swim very close to the bottom. If you want rocks and stuff, buy rocks that are POLISHED, so they wont injure your Cory Catfish. This species is very active and they go around your tank all day like a little submarine looking for food. Buy them in pair because they get lonely, and besides, they like to swim 2-4 in pcks, and its very fun and entertaining for the person thats looking at them! Irecommend this fish! Julli Corys are great! I used to have one but since they get along with my 4 Zebra Danios and 4 Neon Tetras, I'm going to get another one in a couple of days. Are they high matinence and are they freshwater or saltwater? Don't want any surprises when I get them. Low maintenance. Freshwater. They need docile tank-mates though - nobody that will nip at their fins, as cories are not very adept at protecting themselves. They are low maintenance. They are freshwater. They are gregarious. Buy at least two. I have six in a 30 gal. community tank with other fish.